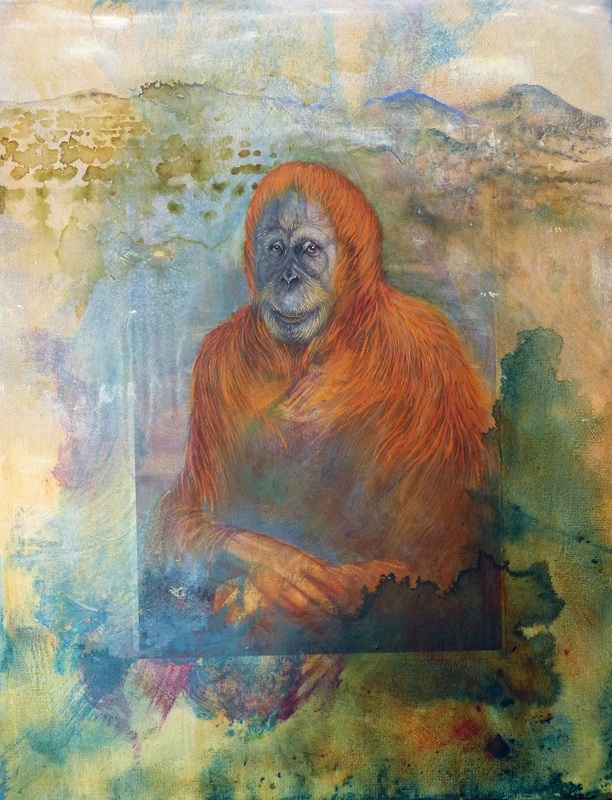 “This is the Price of Palm Oil”, painted in acrylic on wet media acetate, depicts the wildlife of Sumatra and Borneo that shares the forests with orang-utans. All that stands to be lost through deforestation for the unsustainable production of Palm Oil. Each panel measures approximately 60cm deep by 140cm long. Work in progress in the studio…in between sessions of painting at the Melbourne Zoo Orangutan Sanctuary, with the acetate panels stretched across the exhibit windows so the orang-utans could watch. 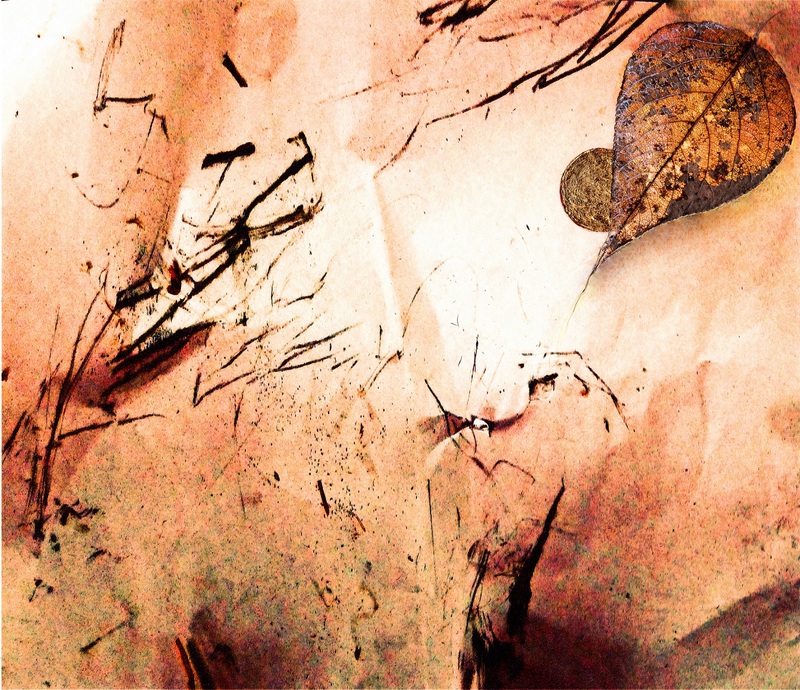 The Last Leaf in the Forest – digitally manipulated print and collage, using a charcoal drawing by Kiani. Wayward Daughter – Dewi. Acrylic and graphite on canvas by Pamela Conder and Maimunah. 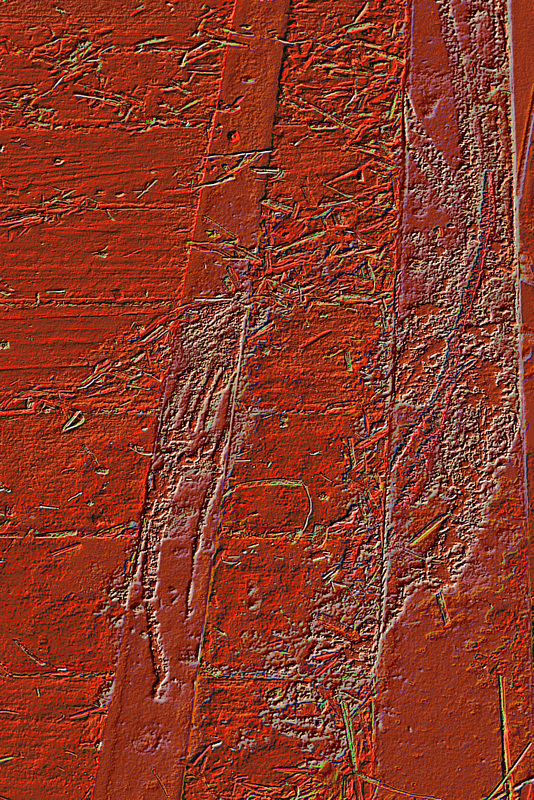 Study in Rust – digitally manipulated print of Malu’s chalk graffiti. Willow – washes over line on paper by Pamela Conder and Maimunah. Warm Abstract – acrylic on canvas by Pamela Conder and Maimunah. Elephant Story – Acrylic on canvas, by Pamela Conder with colour added by Malu. Jungle Cats – acrylic on watercolour paper. Drawings by Pamela Conder on background by Kiani. Found and Lost? Gabby with Dodo. Acrylic and collage on canvas by Pamela Conder and Gabby. Portrait of Youth – Dewi. Acrylic and collage on canvas, by Pamela Conder on background by Dewi. Running to put out the fire. Digitally manipulated print from chalk drawing by Gabby. 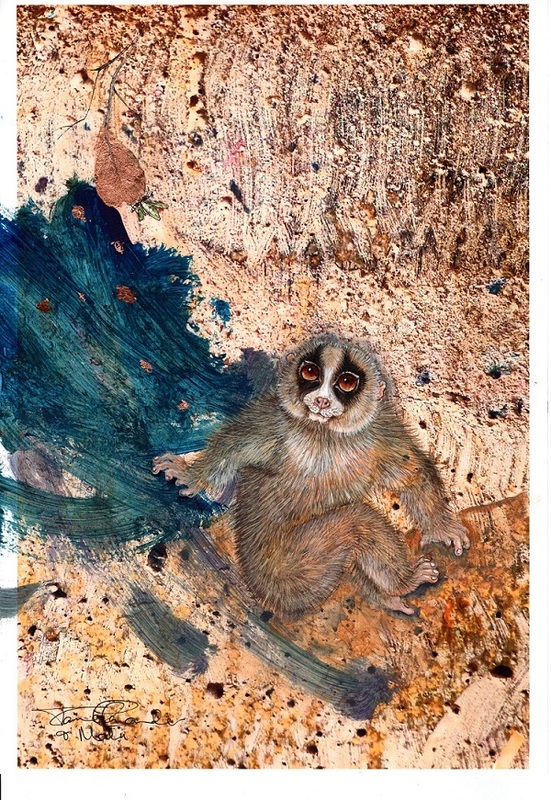 Slow Loris. By Pamela Conder and Malu on digital print of concrete surface. Hornbill – acrylic on canvas by Pamela Conder and Malu. Ancestor Portrait – acrylic and graphite on canvas by Pamela Conder and Maimunah. Embroidered Landscape – digitally manipulated print based on Maimunah’s chalk graffiti. 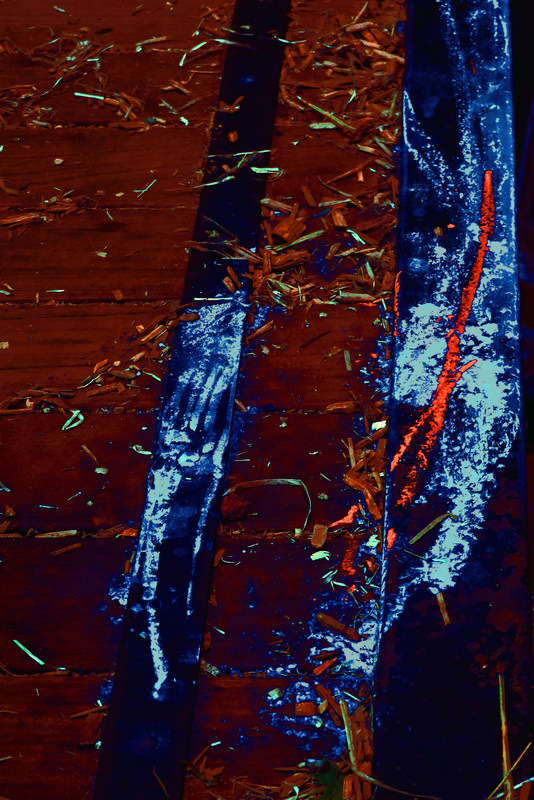 Tracks – digitally manipulated print based on Maimunah’s chalk graffiti. Solar Flare – digitally manipulated print based on a chalk drawing by Malu. Gabby – Line and wash on paper by Pamela Conder and Maimunah. Cool Water – digitally manipulated print based on acrylic painting on paper by Gabby. Warm Air – digitally manipulated print based on acrylic painting on paper by Gabby. Every Orang Utan is an individual, as different as we are from one another. Making eye contact with Kiani can be disturbing. Locking onto the intensely intelligent chestnut gaze of my old friend, I feel I am being interrogated – asked to account for myself. This is a face I have been looking into for 37 years, watching an orphaned infant clinging to her twin brother grow into motherhood herself and eventually to be the formidable personality she is today. Her daughter Gabbi’s tilted almond eyes have a slightly shy querying look. She lacks the raw challenge of her mother’s expression. Mother and daughter with such different eyes and different personalities. When a phone call interrupts one of our art sessions, I watch the expressions flitting across Kiani’s face as a talk and realise that she is mirroring my own. In Kiani’s face I find questions of my own – including that of what engages and holds her interest. Drawing is initially enough. Kiani smiles at a drawing of herself, but quickly loses interest when I begin a drawing of her daughter. I hold up a mirror for her and she smiles the same way that she does at her portrait. Gabby sometimes approaches, but is pushed away by her mother. Willow a female at Taronga zoo is less egotistical. She has even left freshly provided food to sit on the other side of the glass from me and watch as I draw her male companion. After a time it becomes clear that drawing is losing its appeal, so I bring clay and begin modelling a variety of forms. In the first instance, Kiani is so entranced that she actually welcomes Gabby to join us, slinging an arm around her back as they huddle close to the glass watching forms emerge from the clay. I make pinch pot nests and roll little clay eggs to put into them. When mother and daughter are subsequently given their own balls of clay as a behavioural enrichment exercise, Kiani immediately handles hers like a professional. She slaps it into her palm and rolls it as I have shown her, then carefully pinches off a piece at a time and, delicately using one finger, rolls a series of tiny eggs, grouping them together on the deck in front of her. She works left handed, as I do. Gabby’s approach is more investigative. She rolls her ball into a fat sausage, then carries it up to a spiggot where she wets the clay and tests its new slipperiness. She puts it on the deck and uses a piece of fire hose to flatten it. Mother and daughter confronted with the same ‘teaching’, demonstrate two clearly defined responses – imitative and experimental. This provides a clue to how cultures arise in some wild populations of Sumatran Orang Utans. Recognition of individuality and self-awareness highlights the importance of providing optimum living conditions for Orang Utans living in captivity. They need more than food and shelter – they need a life of the mind. They should be leading lives that afford them a degree of satisfaction in their existence. This is why I hope that through art, we can help enrich the lives of Orangutans living in captivity or awaiting release at Nyaru Menteng. Reproduced by kind permission of Zart Art, first published in Zart Extra 2013.